Master Sgt. Danial R. Adams, assigned to 1st Battalion, 10th Special Forces Group (Airborne), Stuttgart, Germany, was killed in action in Afghanistan, Sept. 13. Adams, a native of Oregon, joined the Army in 1995 as an infantryman, where he served with distinction while assigned to 3rd Battalion, 75th Ranger Regiment at Fort Benning, Ga., followed by exemplary service with 1st Bn., 501st Infantry and 1st Bn., 23rd Infantry at Fort Lewis, Wash.
After his assignment at Fort Lewis, Adams earned the Green Beret in 2005. His first Special Forces assignment was as a senior medical sergeant with the 3rd SFG (A) at Fort Bragg, N.C. In 2009, he joined 1st Bn., 10th SFG (A), where he served on a Special Forces team. 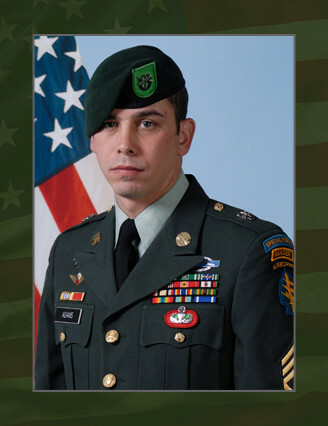 He was killed in action while conducting combat operations with his team in Afghanistan. Adam’s military education includes Airborne School, Jungle Warfare School, Ranger School, Jumpmaster School, Air Assault School, and the Special Forces Qualification Course. His awards and decorations include two Bronze Star Medals, three Army Commendation Medals, four Army Achievement Medals, five Army Good Conduct Medals, two National Defense Service Medals, two Afghanistan Campaign Medals, two Iraq Campaign Medals, the Global War on Terror Service Medal, three Noncommissioned Officer Professional Development Ribbons, the Army Service Ribbon, the Overseas Service Ribbon, the NATO Medal, Special Forces Tab, Ranger Tab, the Parachutist Badge, the Air Assault Badge, Combat Infantryman’s Badge and Expert Infantryman’s Badge. He is survived by his wife Melany, his two sons Jeffrey and John, and his daughter Skye.